The 20 solar car teams below are on the board for the Formula Sun Grand Prix this July (with 7 teams currently all green, 6 yellow, and 7 red). The event will, once again, take place at the Circuit of the Americas in Austin, Texas (above). Because the World Solar Challenge (WSC) is on this year, several teams (including Michigan, the champions) will not be attending the FSGP. It is also a little sad to see that some teams have fallen behind in building their car (and in a few cases seem to have run into major showstoppers). This team completed 40 laps in the FSGP last year, and came 12th in the 2016 American Solar Challenge. This team did not attend the FSGP last year. I am not expecting them to show up this year. This team did not attend the FSGP last year. Their involvement in the FSGP this year is uncertain. This team completed 203 laps in the FSGP last year, and came 9th in the 2016 American Solar Challenge. This team did not attend the FSGP last year. This team did not attend the FSGP last year, but did 133 laps in 2015. This team completed 21 laps in the FSGP last year. This team completed 327 laps in the FSGP last year, and came 11th in the 2016 American Solar Challenge. This team completed 454 laps in the FSGP last year, and came 5th in the 2016 American Solar Challenge. They came 17th in the Challenger class at WSC 2015. They also plan to race at the WSC this year. A car reveal is promised for 3 July. 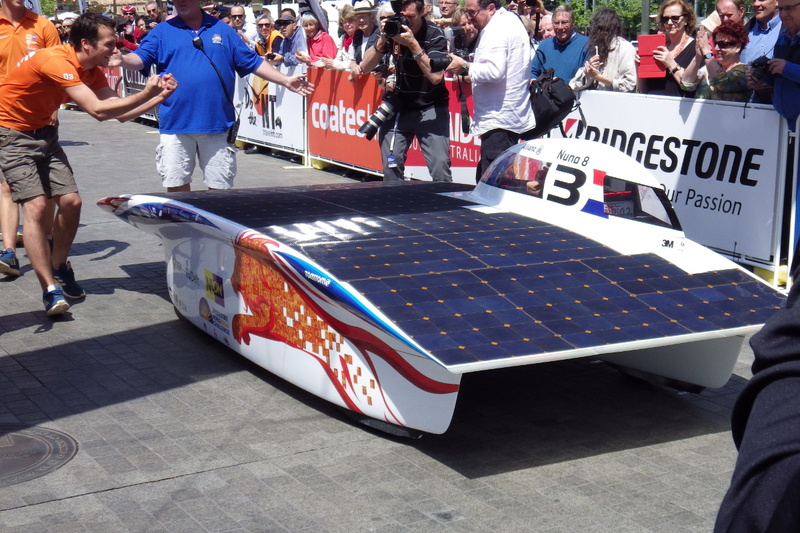 This team completed 195 laps in the FSGP last year, and came 4th in the 2016 American Solar Challenge. This team has reported that they are not attending WSC this year. This team completed 0 laps in the FSGP last year. Their team number (49) is taken from STS-49, the maiden flight of the space shuttle Endeavour. This team completed 321 laps in the FSGP last year, and came 10th in the 2016 American Solar Challenge. Their team number (55) is the year that Western Electric began to sell licenses for silicon PV technology. This team did not pass scrutineering for the FSGP last year. This team completed 308 laps in the FSGP last year, and came 8th in the 2016 American Solar Challenge. This team did not attend the FSGP last year, and did 0 laps in 2015. This team did not pass scrutineering for the FSGP last year. Their team number (786) is the sequence of digits for S-U-N on old phones. This team did not attend the FSGP last year, but did 57 laps in 2015. Their team number (787) is the main telephone area code for Puerto Rico. They are building a new car for FSGP 2017, although they appear to have financial problems. This team completed 414 laps in the FSGP last year, and came 6th in the 2016 American Solar Challenge. Their team number (828) is the telephone area code for western North Carolina. This team has reported that they are not attending WSC this year. The solar car teams below have said that they intend to race at the Somabay Egyptian Solar Challenge this March. Details of the race are still rather thin on the ground – no route has yet been announced, and there is no official list of teams. There are, however, Twitter and Facebook feeds for the race. Those thinking about participating should probably note the travel advice from Australian, US, Dutch, and French authorities. This team came 3rd in the Cruiser class at WSC 2015. They also entered three cars in the 2016 ESC, coming 3rd, 4th, and 5th. This team came 25th in the Challenger class at WSC 2015. They raced in the 2016 ESC, coming 9th. This is a French (or rather, Breton) team, started in 2008. They raced at ESC in 2014. This team came 1st in the Challenger class at WSC 2015. 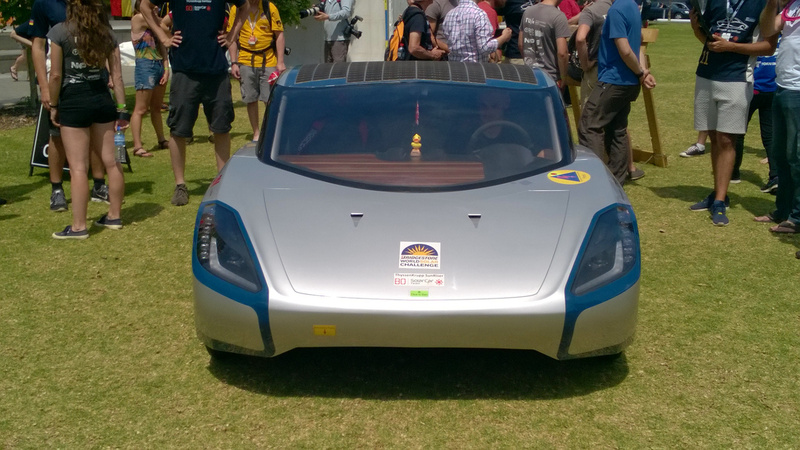 They also raced in the 2016 Sasol Solar Challenge in South Africa, coming 1st. This is a local Egyptian team. They are partnering with Bochum, it seems. They are also planning to race at WSC 2017. This is a local Egyptian team. They are partnering with OSU, it seems. They are also planning to race at WSC 2017. Voyager 1 and Voyager 2, launched in 1977, now heading into the darkness and still reporting back, even though they are over 17 billion km or 16 light-hours away (not shown above). Cassini–Huygens, launched in 1997, now in the final stages of its exploration of Saturn (see fact sheet). 2001 Mars Odyssey, launched in 2001, and still orbiting Mars. New Horizons, launched in 2006, now en route from Pluto to the Kuiper belt object 2014 MU69, which it should reach in January 2019. Dawn, launched in 2007, currently orbiting Ceres (image shown above the Earth). Akatsuki, launched in 2010, currently orbiting Venus, which it will do until 2018. Juno, launched in 2011, currently orbiting Jupiter, which it will do until February 2018. Hayabusa 2, launched in 2014, currently en route to asteroid 162173 Ryugu, which it should reach in 2018. It will then take a sample which should arrive back home in 2020 (not shown above). ExoMars Trace Gas Orbiter, launched in 2016, currently orbiting Mars and mapping the Martian atmosphere (the associated Mars lander was lost in 2016). OSIRIS-REx, launched in 2016, currently en route to asteroid 101955 Bennu, which it should reach in 2018. It will then take a sample which should arrive back home in 2023 (image shown below the Earth). In addition to the above, BepiColombo is scheduled to launch for Mercury in October 2018, and SolO is scheduled to launch for the Sun that same month. Also, InSight is scheduled to launch for Mars in May 2018, and Solar Probe Plus is scheduled to launch for the Sun in August 2018. 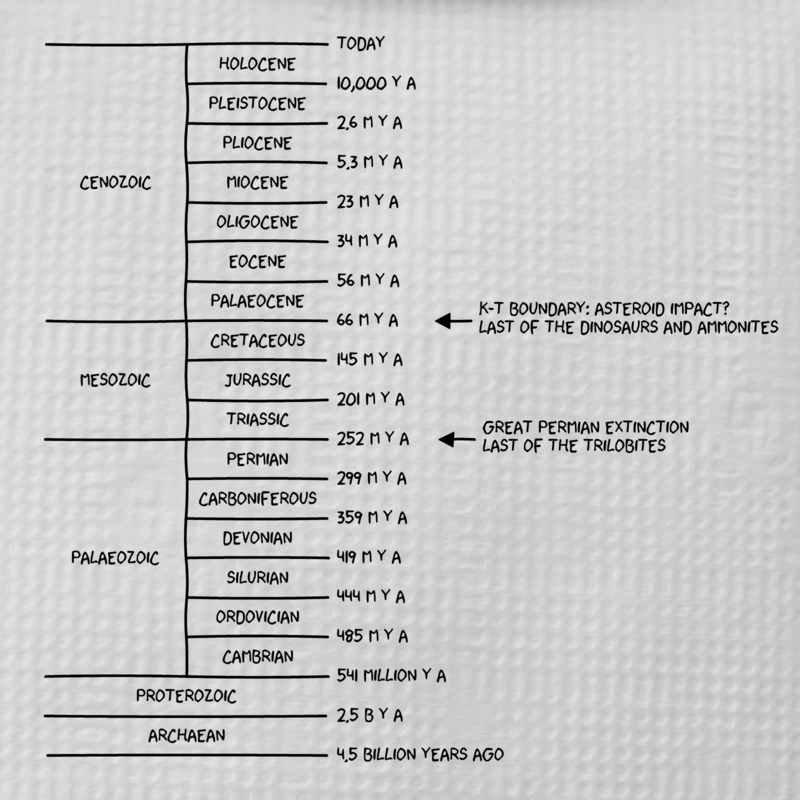 Above, as an experiment, is a diagram of geological eras and epochs, based on this Geological Society of America chart. The background image is from here. The diagram was constructed using fairly standard R, together with the XKCD font. A number of people seem to have become concerned about changes to the WhiteHouse.gov website. In fact, this website belongs to the current US president, and (as far as I can tell) he can fill it up with nothing but cat videos if he so desires. However, it generally hosts a mixture of current administration policy and praise for whoever the current president happens to be. I’ve heard particular concerns about the “open data” section of the old WhiteHouse.gov site. This was archived as well. Not that it was all that exciting – there were several spreadsheets, like the salary data I used to produce the histogram below. Most were poorly documented. US government datasets are generally maintained on specific agency websites and at data.gov. 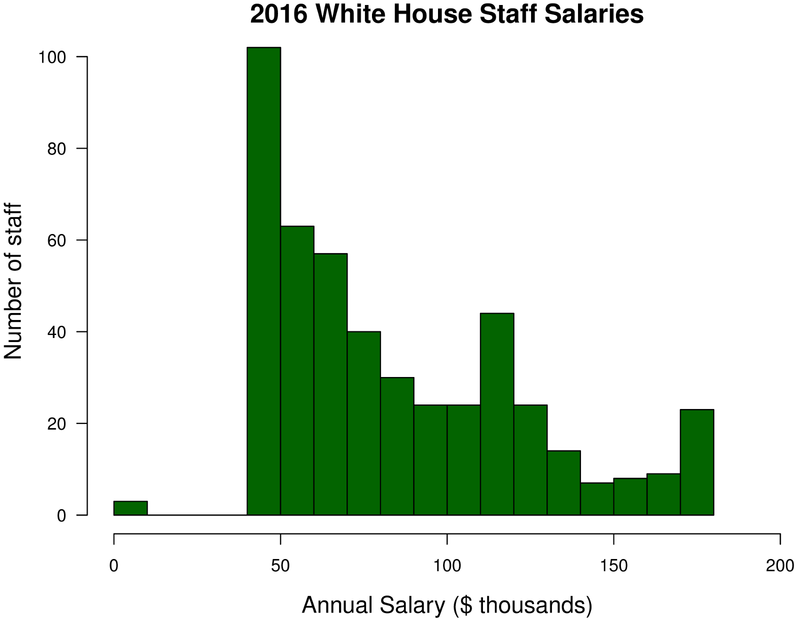 In particular, the White House staff salary data is available in a better-organised form at catalog.data.gov/dataset/white-house-staff-salaries-2011-16. It is not clear what is happening with the developer website at github.com/WhiteHouse. On the whole, it seems to me that there are far more serious issues in US politics at the moment than this one. Just one problem – it’s not exactly true. Giordano Bruno was a Catholic (Dominican) priest with a taste for unorthodox beliefs. He was first accused of heresy in 1576, four years after being ordained. He flirted with Calvinism and spent time in England, France, and Germany, but quarrelled with people wherever he went, and eventually returned to Italy. There the Inquisition condemned him, primarily for stating that “Christ was not God but merely an unusually skillful magician” (he was not condemned for Copernicanism, because that was not declared heretical until 1616). Bruno was a philosopher and theologian with interests in astronomy and magic, rather than a scientist. He wrote no scientific works, although he did have several interesting ideas on the “art of memory,” and discussed the ideas of Copernicus with approval (though not always with understanding). He also suggested that distant stars had their own planets and life, although he had no evidence for this speculation. Few of Bruno’s works have been translated. Two that have been are Gli Eroici Furori and La Cena de le Ceneri. The latter includes a mix of religious, philosophical, and astronomical ideas. 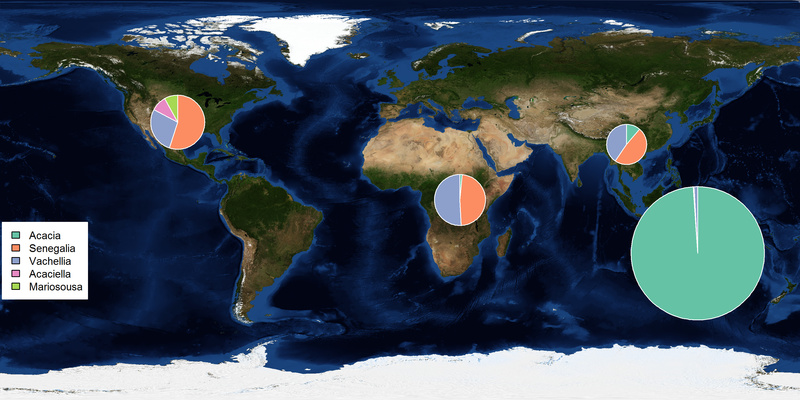 The map below shows the distribution of the new genera, divided into the Americas, Africa, Asia, and Australia & the Pacific (background image from NASA Visible Earth). 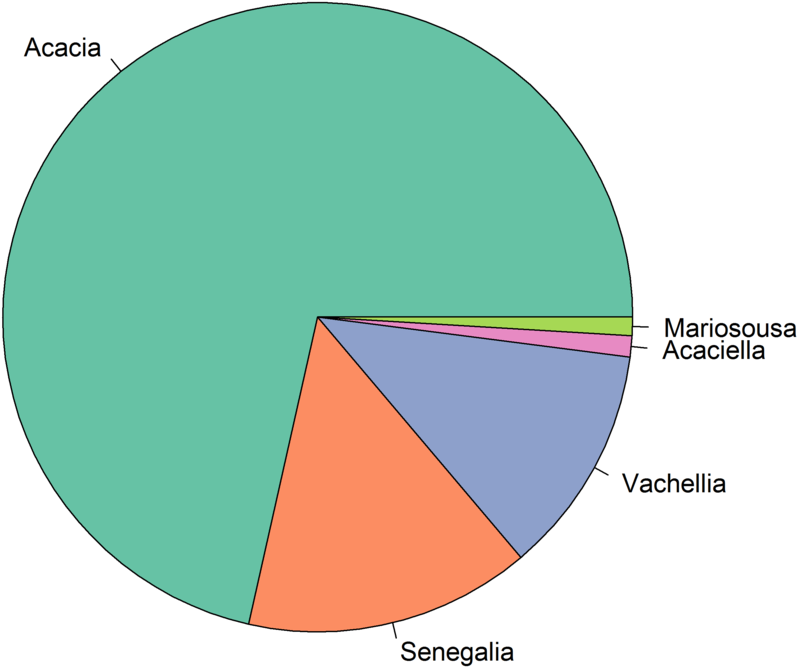 A degree of reorganisation was going to be needed whatever nomenclature proposal was accepted, but it certainly made sense to retain the Acacia name for 71% of the original species (although Wikipedia, which becomes more and more partisan as time passes, ran a campaign against the official decision for several years). The botanical community seems quite happy using the new names, and it does not seem that the issue will resurface at the XIX International Botanical Congress later this year, although there continues to be debate about how to resolve similar issues in the future. About 13 species, in the Americas. See theplantlist.org. About 15 species, in the Americas. See theplantlist.org. About 163 species, throughout the tropics. See theplantlist.org. About 203 species, throughout the tropics. See theplantlist.org. This genus is likely to be split further. About 987 species, almost all in Australia and the Pacific.